You should have known better. The house party wasn’t exactly a wine lover’s haven, but you brought a bottle of your favourite Sancerre just because you felt like sipping something that didn’t remind you of either purple-tinged vinegar or pancake syrup mixed with some type of unidentifiable vegetal matter. You went to pour your first refill and discovered… an empty bottle. 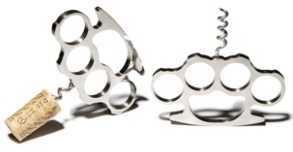 Here’s a wine accessory you can brandish around that just might solve the problem – the brass knuckle corkscrew. No, we’re not kidding. This nifty what-do-you-get-the-geek-with-everything gizmo was so weird we just had to laugh. This entry was posted in corkscrew, wine accessory and tagged Corkscrew, Food, Recreation, Shopping, United States, Wine, Wine Accessories, Wine accessory. Bookmark the permalink.